Ann is a life-long resident of Anchorage. She attended the University of Alaska Anchorage where she received a Bachelor’s in Education with a minor in computer programming. Ann worked at Wendler Middle School for eight years teaching geography, language arts, study skills, media literacy and a number of other electives along the way. 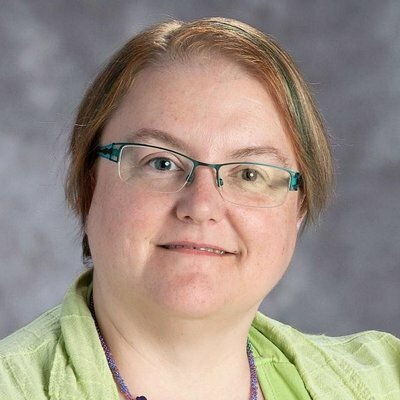 In 2001 she started the school library media specialist certification program through the University of Washington and in 2002 moved to Bartlett HS where she was the librarian for 5 years. In July of 2007 Ann took the new library curriculum coordinator position for the Anchorage School District and moved to cubby-ville at the ASD Education Center. Her primary responsibilities are support of librarians through professional development and site visits, and working with the curriculum department to make sure library collections support not only student interest but support curriculum across all subject areas. In 2009 Ann completed a Graduate Certificate program in E-Learning through the University of Alaska Anchorage. She have served on many different committees (because everyone knows she won’t say NO) and is active in several volunteer organizations. Her hobbies are reading, beading, reading, knitting, and well, reading…..